I first became aware of Todd Henry‘s work when I was doing a deep dive into design thinking and creativity research a few years ago. 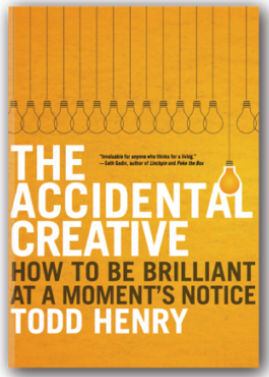 His book, The Accidental Creative: How to Be Brilliant at a Moment’s Notice, is kind of a guide book for creative professionals who make their living on their ideas. The book maps a process that he’s created and honed over years as a creative, trainer, consultant, author, and speaker (see a full services and creative resources on the Accidental Creative agency website). Henry provides strategies to help readers figure out how to focus energy and attention on the most important, value-creating work while cultivating inspiring relationships and creative inputs and managing time effectively. His catchphrase for this book, and his long-running Accidental Creative podcast, stuck with me for a long time: “Cover bands don’t change the world.” As a faculty member, I am driven to change the world in some way, and the best way to do that is to do the things only I can do. As I’ve read more of his work and listened to hours of podcast episodes while working out, the more I see how many of the situations, challenges, and inspirations that drive creative professionals are at work in academia as well. Academics are creative professionals, no doubt about it. We have a good deal of control over our schedules, what we teach and research, how we teach and research. We are driven to make an impact on our students, peers, disciplines, and communities, to engage in important conversations, to add value to the world. And we can also work ourselves into a hole of overwhelm or, worse, burnout. We have to manage our creative energies even within the steady rhythm of semester after semester. Like I do in Agile Faculty, Henry lays out strategies to manage your creative energy, acknowledging that creative professionals (like faculty) do need a process to harness and sustain that energy. 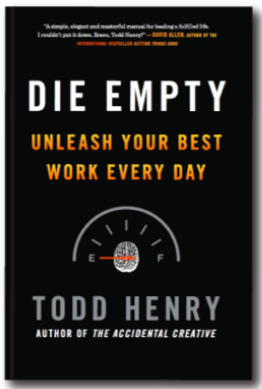 This summer, I picked up Henry’s second book (there are four total as of 2018), Die Empty: Unleash Your Best Work Every Day, because of its main themes of focusing on creating value with your work every day and avoiding stagnation and expectation escalation, topics important to me as I work through an episode of burnout. Henry defines work as anything you do that adds value to the world with the tools and resources you have. This is a concept I’ve been thinking about for most of the summer after reading it – I’m always working and even find ways to turn fun into work (I ride a horse? I must compete! Yeah, no). But what value am I creating? How much of what I’m doing is am I doing just because I always have, or because I feel I have to top my previous achievement, or because I feel like I should do it, regardless of if that is really true? How can riding my horse not be “work work” but instead something that simply adds value to my life? I’m just going to let those sit there for us all to think about. Can you see yourself or a colleague int these myths? Does academia perpetuate these myths to our great detriment? (I’m going to say yes on that one, sorry not sorry.) What value do es our work create outside of these myths, and how can we support each other, our grad students, and our undergraduates? If you appreciate the style of work by Seth Godin, Adam Grant, Dan Pink, Dori Clark, and that crew, you’ll enjoy Henry’s books. Some academics might dismiss Henry’s work because his insights and recommendations are built on his business and personal experience rather than empirical research, but I like to mix books like these into my reading because I love seeing how we can think about ourselves and our work from different angles and learn new approaches (hence, Agile Faculty, right?). These are easy reads that I recommend if you need a little injection of creativity to think of yourself as the creative pro that you are.